Hundreds or even thousands of Nazi war crimes suspects could still be at large, one of the world’s leading experts on the matter said Thursday, ahead of International Holocaust Remembrance Day. 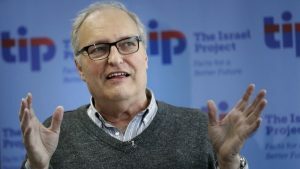 Efraim Zuroff said he expected a spike in convictions in the coming years despite most suspects being in their 90s, but admitted most were unlikely to face justice as many countries are unwilling to pursue cases. “There are still hundreds, if not thousands of these Nazis, but the problem is who among them can be brought to justice?” the so-called Nazi hunter told an event ahead of International Holocaust Remembrance Day on Friday. Since 2001, 104 Nazis have been convicted over their roles in the Holocaust, in which around six million Jews were systematically exterminated, figures from Zuroff’s Simon Wiesenthal Center show. The annual number has been declining, however, and between April 2015 and March 2016 there was only one conviction, with two new cases filed. In June a 94-year-old former guard at the Auschwitz death camp was convicted in Germany. Zuroff said he expected the number to increase in coming years. “There will be a spike because of the whole change in German prosecution policy,” Zuroff told AFP. In 2011 German legal policy changed to allow prosecutions of those who worked for the Nazis in the death camps, rather than specifically having carried out a killing, allowing for new trials of men and women in their 90s. While he hailed Germany’s commitment to prosecuting as many suspects as possible, Zuroff pointed out many other countries have not pursued trials. Collaborators in many countries had been largely immune from prosecution as their governments were unwilling to push the matter, he said. “In a country like Ukraine, for example, there are a lot of Ukrainians who were involved,” he said. Zuroff said in both Norway and Sweden statute limitations mean that Nazi war criminals could not be prosecuted. “In Norway there were people who volunteered for the SS, were sent to the east and were involved in crimes against humanity in Ukraine,” he added. Zuroff said it was a race against time to convict people before they die. “It is drawing to an end for obvious reasons,” he said, calling it the “biological solution”.